Many utilities face water scarcity and a future of uncertain supply. In response, they're diversifying their supply portfolios with alternatives to surface and groundwater. However, to select the most appropriate water supply options and treatment approaches, communities need a stronger understanding of the benefits and challenges of the options, including their energy needs, financial requirements and public and environmental health impacts. Comprehensive Analysis of Alternative Water Supply Projects Compared to Direct Potable Reuse — published by The Water Research Foundation in 2018 — aims to help utilities compare the costs and benefits of a variety of supply and treatment approaches. 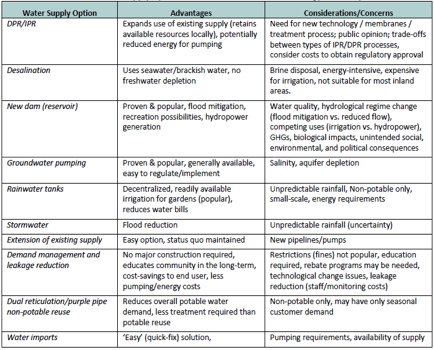 The project — led by Dr. Ben Stanford of American Water and researchers with Hazen and Sawyer and the University of New South Wales — identified 10 supply options and summarized the advantages, disadvantages, and other considerations for each (Table 1). Water supply options considered during development of the TBL methodology and tool. Source: Stanford et al. 2018. The results of an industry survey, stakeholder workshops and interviews with utility leaders were used to develop a quantitative framework and interactive tool that allows utilities to conduct triple bottom line analyses of direct potable reuse projects compared to other alternative supply options at the individual unit process level. Ultimately, the main priority is to identify supply and treatment options that are protective of human and environmental health. The research used a multicriteria decision analysis approach to provide structure and factor in site-specific information for individual supply options. The primary outcome is the Water Supply Evaluation Tool (WaterSET), which uses a hybrid life cycle cost analysis that includes supply chain impacts from upstream activities related to supply options (such as the manufacturing process for membranes). The tool is designed to better capture the direct and indirect economic and environmental impacts of supply options and so help water planners and decision-makers understand the benefits, costs and constraints that could affect the feasibility of a supply option. WaterSET also gives users flexibility in prioritizing various criteria. For example, different communities may value factors such as drought resilience or eutrophication differently. The tool allows users to prioritize criteria according to their needs while maintaining the integrity of the analysis. In this way, WaterSET helps utilities consider many important criteria that can help identify the most desirable supply options. To ensure the applicability of the tool, case studies were conducted with an Australian utility and two United States utilities, including Hampton Roads Sanitation District. HRSD, a coastal wastewater utility in Virginia, investigated groundwater augmentation with advanced treated reclaimed water as an alternative to surface water discharge. The district is considering that strategy because of anticipated regional benefits related to drinking water supply, land subsidence, saltwater intrusion and nutrient management. The district considered both carbon- and membrane-based advanced water treatment and used WaterSET to compare the two treatment options. The WaterSET outputs — including the radar chart shown below — helped to determine the most favorable treatment option across different criteria. The data gave HRSD quantitative information about the treatment approaches to facilitate informed decision-making. 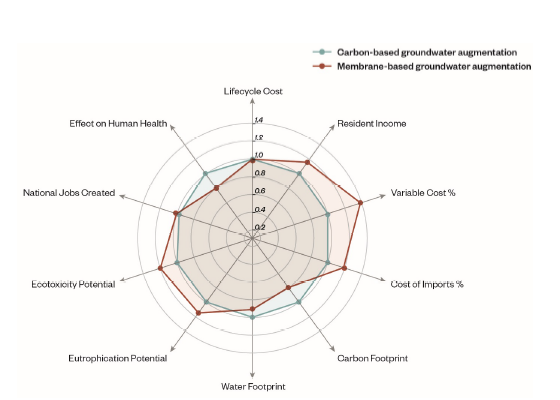 Radar chart generated from HRSD inputs pertaining to two treatment approaches for groundwater augmentation. Source: Stanford et al. 2018. Enabling them to evaluate supply and treatment approaches for a single water supply or across a suite of supply options. Providing an opportunity to determine whether and to what extent different weighting factors may affect the evaluation of a specific supply or treatment approach. Providing a flexible approach to triple bottom line analysis by allowing for underlying data to be expanded and updated. Serving as a relatively simple means for scoping and examining how various supply option compare at the unit process level. WaterSET is a fully customizable and user-friendly application that can be used in any region in the U.S. or Australia. It is an efficient way to examine how potable reuse could become more important as water scarcity and social acceptability increase. An integrated approach, along with the use of this tool, can help utilities streamline their processes and incorporate potable reuse methods that uniquely meet the needs and fit the resources of their communities. About the Author: Alyse Greenberg is an editorial assistant at The Water Research Foundation.